Use your own ideas; even if they are not professional, they provide precious and unique memories. 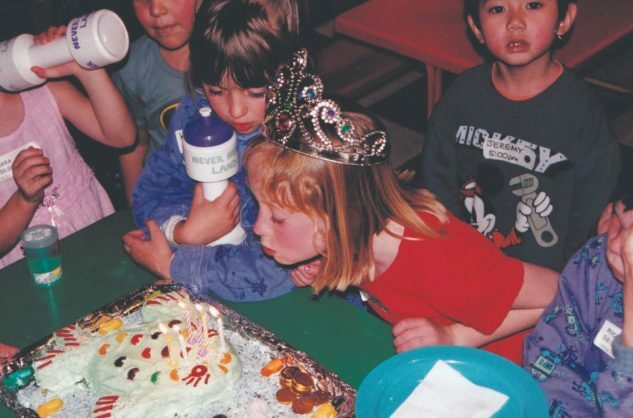 When we arrived in South Africa in 1990, it was to the disturbing realisation that, in northern suburbia the “keeping up with the Joneses” form of social snobbery and showing off extended even into the world of childrens’ parties. My son went to a play school where even the “yummy mummies” arrived in BMWs: not many worked … unlike both my wife and I, whose jobs together didn’t generate enough money to keep up, never mind show off. 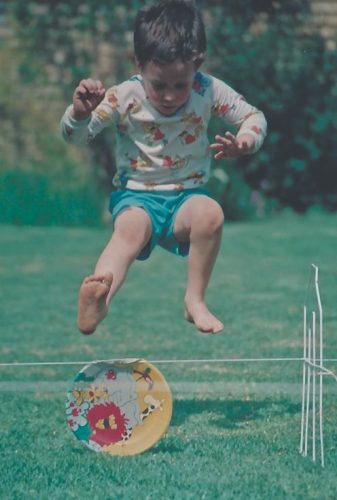 When I grew up, kids’ parties were just events where the children could let their hair down: eat too many sweets, play games and run around until they were exhausted. They were all pretty much alike with the “old fashioned” games and activities like the “egg and spoon race”, three-legged race, sack race (all from school sports days, it must be said) and the perennial favourite, “pass the parcel”. In Joburg, though, just as much as having a BMW parked in the drive was an “I’m better than you” symbol, so too were the no-expense-spared kids’ parties. It was our first encounter with hired jumping castles and slides, not to mention the jesters and clowns who would be paid a serious amount of money to “entertain” their young audience. In the beginning, my wife and I looked at each other in near-despair. But, we resolved that, because we didn’t have money, we would have to do it ourselves. And that led to some memorable parties, made all the more satisfying because they were different and because the kids enjoyed them more than the expensive shows the other parents paid to put on. My son’s second birthday saw us in the kitchen until after midnight, putting the finishing touches to the centerpiece of the birthday table – a Formula One car cake. My design, my wife’s baking and icing. And so realistic that one of the boys invited almost caused a disaster by trying to push it along the board on which it sat. We did many of the games and activities from our childhoods, and were amazed to see few urban sophisticated Joburg kids had ever experienced them. Over-and-under obstacle races and pass-the-parcel were particular favourites. One year, we decided that we would have a “Gummy Bears” theme, after my son’s favourite TV show. I spent a whole week of nights in the garage, fashioning a Gummy Bears boat out of cardboard and wire and attaching it to our wheelbarrow. It was impressive: head of a hawk in yellow and blue at the front, with brown wings along the side. And it was the biggest hit of the day – bigger even than the individual Gummy Bears lanterns each child got as they left, which were packed with sweets. Even in those days, few city kids had seen a wheelbarrow, never mind going for a ride in it. It was such an amazing experience for them, they queued again and again to go (at most I could push two or three small ones, most times it was just one … you could also go a lot faster then). There was also a Gummy Bears tunnel, through the garden undergrowth and accessed by a golden door (attached to a tree), which was a hit, too. The tarted-up wheelbarrow was the main attraction a few years later at my daughter’s “Cinderella” birthday party. This time, Dad had to figure out a way to turn the wheelbarrow into the golden, magical carriage. 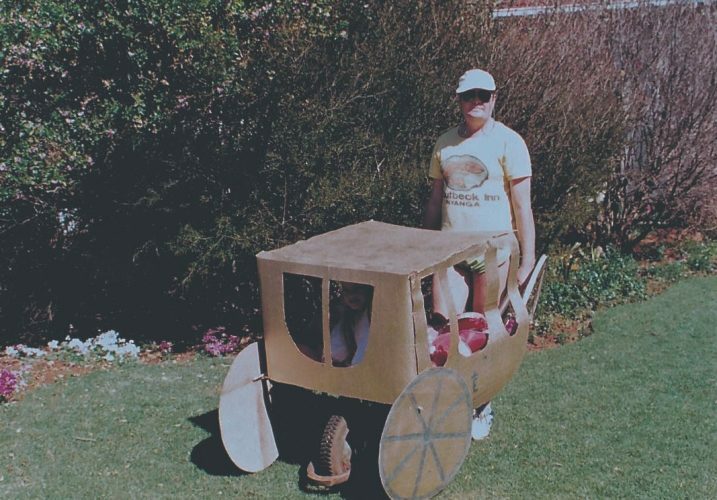 It looked odd to me, but everyone loved it as they were chauffeured around the garden in their “coach” in their wonderful “princess dresses”. Our last real party for my son – before he realised his parents were morons (it starts around 12 and if it hasn’t happened to you, don’t smirk: It is coming!) – took me more than a week to set up. Using my experience as a counter-insurgency instructor in the army, I built a “jungle lane” series of moving targets around our garden. I gave the boys each a small plastic gun which fired harmless rubber-tipped darts. I would trigger targets to rush, along wires, from one tree to another, or pop out from behind a wall, using rubber from bicycle inner tubes to propel them. The boys loved it and did it again and again, seemingly not bored by the same targets doing the same thing. • Use your own ideas; even if they are not professional, they provide precious and unique memories. An outsider won’t do that for you. • Play the “old” games. Even in the age of digital screens, children love something different – and energetic. • But trust me on the wheelbarrow. It is the cheapest way to entertain kids.